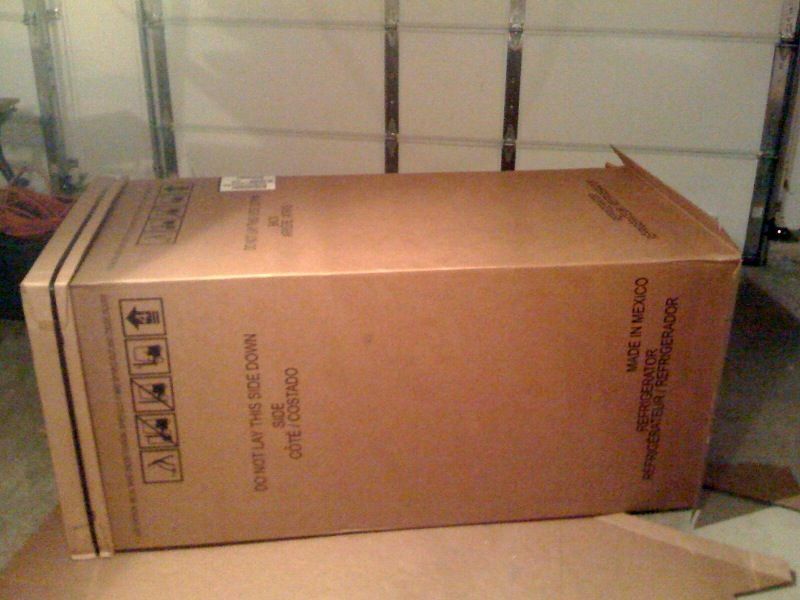 - A large refrigerator box. Begin by cutting and laying flat the box. My dimensions were based on the size of my box so you may have to make adjustments. Using a straight edge, mark and cut out the top angles and tabs. Each panel is 2 feet wide because my box was 12 feet total. The tabs are 5 inches long and 2 inches wide. The receiving side is 2 inches wide. I made the receiving slot cuts by just eyeing up the tab locations when I stood it up. Widen the slots a little bit to make it easier to insert the tabs. Run a blunt tool down the cardboard to help make the folds where you want them to be. Using any circular object you like, trace and cut out any windows you would like. Spray paint the outside any color you want. I primed the areas with writing but it isn't really necessary(it's just a cardboard toy remember) Be careful not to apply too much paint or the cardboard might warp. Using a sharpie I made a few rivets and other lines on the ship. Use your imagination and even get your kids help to make your (I mean their) rocket ship cool. 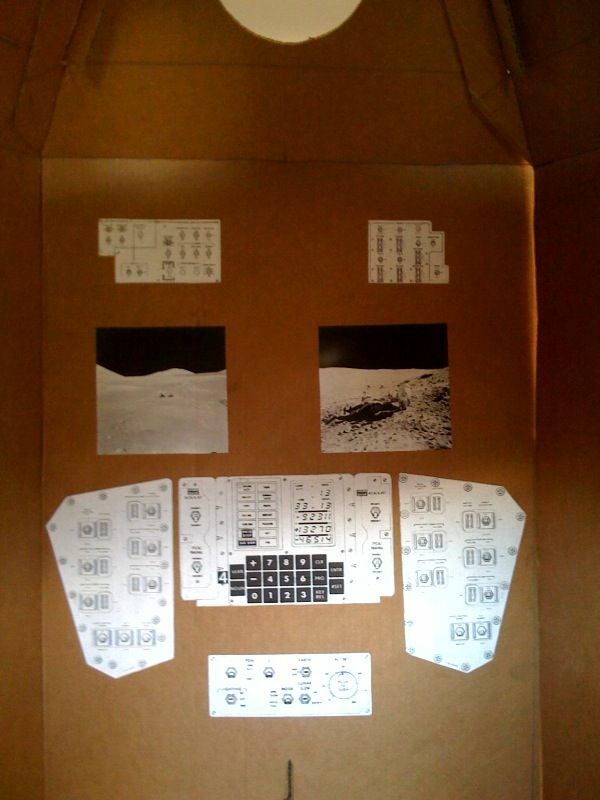 For extra points I went online and found a website with a drawing of a real lunar module's cockpit. I "borrowed" a few images and printed them out. I hope this instructable will give you ideas to do something with all those cardboard boxes after Christmas. Before recycling them of course! -After folding up and moving the rocket a few times I have noticed the paint coming off onto my hand. So painting it might not be a great idea. -The door has taken a beating, so some packing or duct tape is recommended for support. I'm sorry I have no ability for this stuff but really want to make this for my son. I can't quite get it- did you just use the folding sides of the box (bottom/ top) to make the pointy top, or did you use the body of the box? I need more detailed instructions, can't quite get it. Where do the fancy cuts come in from the first picture? I don't have a jig saw, is that ok? I need the exact measurements to the box. 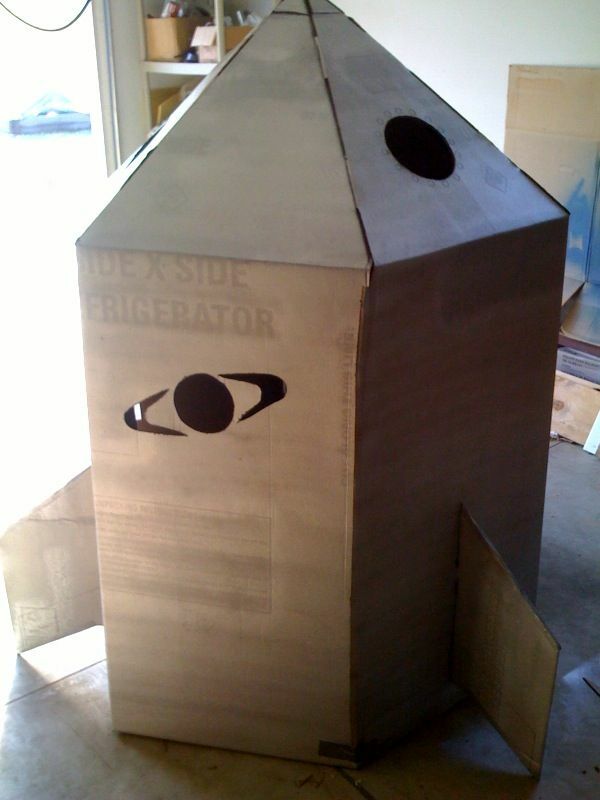 I just made the rocket ship for my son's astronaut birthday party. he loves it. Now on to decorating it. Where did you get the control panel print outs? How did you join up the long side? I am assuming you had six panels, so you scored the box to be a six sided ship, right? I love it and will begin tonight, Making it for my grandson's 5th grade class. The rocket was made out of one box. I only had to connect one side. As shown in the photos I made a few tab/inserts that held it together. There are not six separate panels. What a fun idea for children to build on the weekend. Bravo! The black gaffa on the edges helped with the structural integrity, especially where the rectangular boxes were cut into a hexagonal shape. Painting was a pain, it took several coats of kid-friendly white paint to make it look OK. I really liked how the cheap (but thick and wide) aluminium foil turned out, just a light coat of craft glue and then I placed it on and trimmed the edges with a knife. All up about $100 including paint, gaffa (cloth tape) and LED lights. All the gear inside (except lights) was old hardware I had lying around. Some of the lights will be re-used for extra visibility when bike riding in winter. That turned out great and it looked like an awesome party. Since you liked my rocket you might like this for your next project. Sweet! That looks so cool. What were the measurements of the flaps? With the tabs? cool instructable, thats exactly was i was looking for! Well if you have trouble getting that silly song out of your heads might I suggest the theme song to Hogans Hero's that usually does it. No I did not make that video.